Netflix has done an incredible job over the last two years of establishing itself as a creative powerhouse akin to HBO in their glory days. However, original content like House of Cards and Orange is the New Black doesn’t come cheap and it is already having a negative impact on profit margins, even with 50 million paying subscribers globally. The marketplace for other content is also going to increase in cost driven by competition from all fronts including Amazon, there is only so much watchable stuff in the marketplace. With more than $8 billion in short and long term content cost obligations on their books it might make sense to move to a PBS model where certain programming is underwritten by a brand sponsor in order to keep their per monthly subscription cost below $10. I don’t think they would ever try to sell traditional :30 interruptions during a program. The caveat for Netflix would be having to share how many people stream each program which they now closely guard as a negotiating tactic with content suppliers. I think there would be a huge market to advertise on their platform and the market will eventually make this a no brainer option for them to offset the coming tidal wave of content costs. This is a big risk for their current business model as they derive around 60% of their revenue from cable TV providers as part of your cable package. However, it is where the market is going and the potential revenue from a la carte purchases (buying a game or a package of games) and more targeted advertising could bring in much greater revenue that the current business structure. 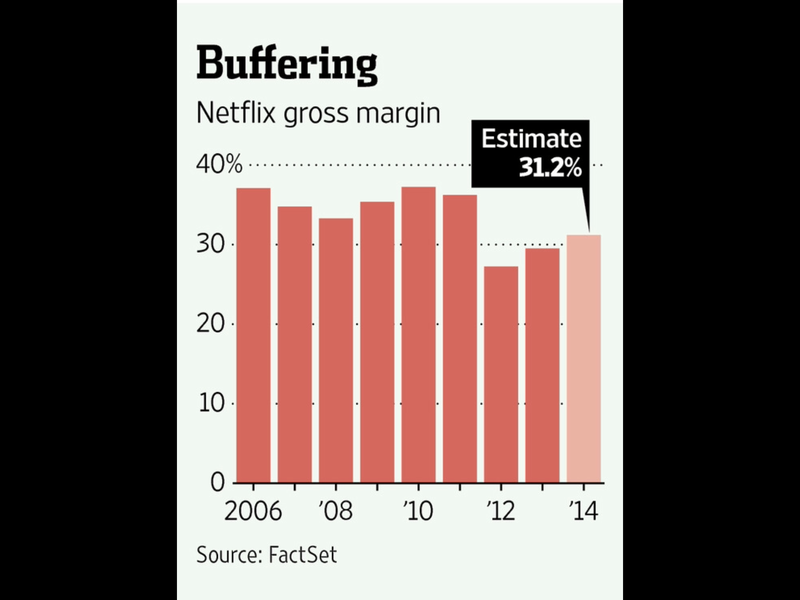 What happens when people can consume content without a cable package? What could make up the revenue shortfall? 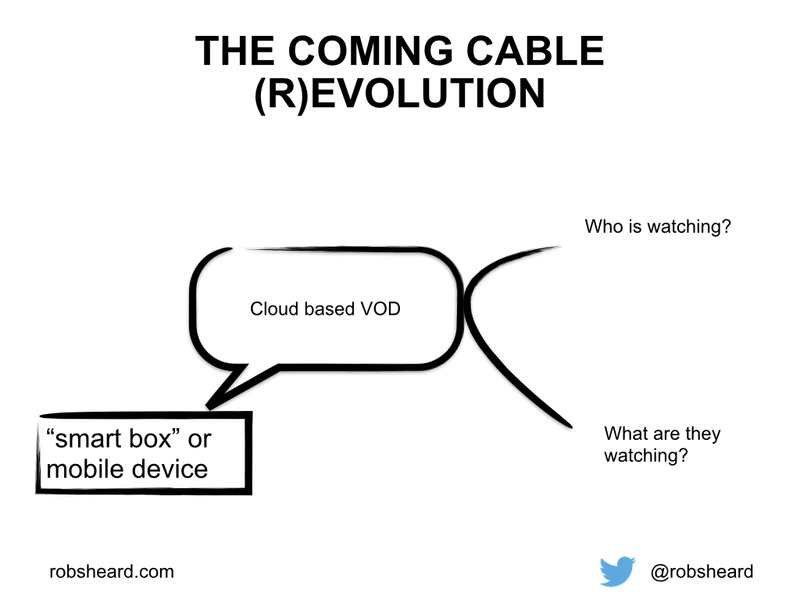 Video on demand is driving content consumption. This can be live or recorded and through an internet or cable connection. The channel and time driven tune in window programming format is on the way out. More targeted advertising through programmatic buying platforms has re-shaped how internet advertising is purchased. Big spending advertisers will demand that TV eventually be sold the same way. 65% of advertising on the internet is now purchased on a performance based model. As smart set top boxes evolve, “smart TV” penetrates more households and more content is consumed on mobile devices the opportunity for hyper-targted advertising through TV/video will become the standard in the marketplace. The tools marketers that use to build deep data profiles constructed by piecing together a consumer’s engagement across multiple touch points that live in the cloud driven by Adobe, IBM, SalesForce, Oracle and SAP will drive more change in the $75 billion dollar TV advertising business than anything else in the last 60+ years. In the context of a campaign you might buy short form to generate awareness to drive the consumer to long form to complete the path to purchase. If you think of this as one big story across multiple media platforms creative consistency across all of the touch points becomes even more essential for the story to make sense. iPhone 6 orders are forecast to be the most in demand product in the 38 year history of the brand. Just last year analysts and journalists were bemoaning the death of the brand with the passing of Steve Jobs. What they didn’t account for was the culture he created and the empowerment he entrusted with Tim Cook to make the brand his own. When a real sense of mortality and reality set in with Jobs he seemingly spent a lot more of his genius focused on creating not just a new iPhone but a company culture inspired by his values of the intersection of art, technological innovation and emotive marketing. If you look at the list of recent hires from Dr. Dre, Jimmy Iovine, Angela Ahrendts, Marc Newson, Ben Shaffer, etc. Tim Cook is creating an unparalleled culture of creativity all built around the values Steve Job espoused and created the most interesting company training program in the world. In any business your most valuable asset is the team of people who work there, I think Tim Cook’s roster of talent may exceed the current market capitalization that is already the most valuable in the world. Has any sports league imploded faster than the NFL over the last week? The Ray Rice video and the Adrian Peterson child abuse charges certainly seem like the tipping point in negative public sentiment against a league that has been bullet proof as a money minting machine. The big question is when will people stop watching? As a father of three daughters I find the whole week disturbingly repulsive and will skip football this Sunday for the first time in thirty or so years. I think that is the only way the owners will come to their senses and make a change at the top by firing Roger Goodell, unless they are unexpectedly influenced by Bill Simmon’s mailbag column. The only thing these guys understand is money and with the unforgettable video and graphic images of abuse how can the league ever recover? 1. Extremely high levels of income. According to the tax filings and estimates he released earlier this year, Romney earned about $21.7 million in 2010 and $20.9 million in 2011—most of it from capital gains on investments related to Bain Capital. This is a lot of money, but Romney may well have earned considerably more in earlier years. His ten-year severance agreement with Bain Capital ended in 2009. The terms of it haven’t been revealed, but quite probably it allowed Romney to keep pocketing a substantial portion of the firm’s profits. And the years before 2008 were massively successful ones for Bain and other private-equity firms. But even if Romney earned fifty million dollars a year in some years, would be that be sufficient reason for him to keep his returns secret? I doubt it. Americans don’t begrudge people a telephone-number income as long as they are perceived to have earned it. And insofar as any private-equity mogul earns the money he makes, Romney earned his. He created Bain Capital and ran it for (at least) fifteen years. 2. More offshore accounts. The Obama campaign has already made much of Romney’s Swiss bank account, his Bermuda-based investment company, and the income he receives from Bain Capital-related trusts that are domiciled in the Cayman Islands. It is perfectly possible that in the years before 2010, Romney and his financial advisers were even more aggressive in their use of overseas investment vehicles and tax shields. Hedge funds and private-equity funds, such as Bain Capital, routinely exploit offshore shell companies, to minimize their tax burdens but also to escape government regulation and oversight. Here, too, though, I doubt whether this would be sufficient reason to justify not releasing the returns. 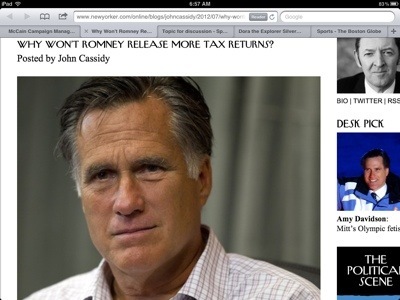 Thanks to the Obama campaign, Romney’s name is already indubitably linked to offshore accounts. I doubt whether the average American is very shocked. Most people know full well that one of the reasons rich people employ so many fancy accountants and tax lawyers is to shield as much of their income from tax as possible, and that one of the ways they do this is by keeping cash offshore. 3. Politically explosive investments. Over the years, Bain Capital invested in all sorts of companies, including some that helped corporations outsource and offshore some of their operations, and one, a medical-waste-disposal company, that helped family-planning clinics to dispose of aborted fetuses. Romney, even after he left, kept much of his money in investment funds managed by the firm. First I think all think all of these are true, I would like to speculate on point #3. What if his trust made bets against mortgage CDOs in 2007 or 2008 that delivered a huge return? By 2006 and 2007 the investment banks like Goldman Sachs that built the mortgage CDO industry began to bet against them in the form of credit default swaps usually sold by AIG. Goldman Sachs was the biggest of the profiteers at the expense of the American tax payer to the tune of a direct transfer from the treasury of $13.9 billion dollars which backed AIG’s bets at 100 cents on the dollar. If you add in the $8.4 billion AIG transferred in collateral they would transferred over $20 billion in risk that was covered by the US taxpayer. These default swaps would be extremely profitable for banks like Goldman as rates are similar to buying life insurance at a small premium and hoping they die quickly. What if Romney’s trust showed huge income from these sorts of investments while the US taxpayer was withering on the vine and their taxes were being used to bail out Romney’s hedge fund/investment bank ilk who took on extremely stupid risks? Is there a more made for TV political ad? Is this something the Romney campaign could recover from (I doubt it)? Romney released 10 years of records to the McCain campaign in 2008, some of these could have leaked to Obama campaign and they will be willing to spend all of their TV ad dollars until Romney is forced to release them knowing it will kill his campaign. The only people who know what business Wall Street is in are the traders. They know what business Wall Street is in better than everyone else. To traders, whether day traders or high frequency or somewhere in between, Wall Street has nothing to do with creating capital for businesses, its original goal. Wall Street is a platform. It’s a platform to be exploited by every technological and intellectual means possible. The best analogy for traders ? They are hackers. Just as hackers search for and exploit operating system and application shortcomings, traders do the same thing. A hacker wants to jump in front of your shopping cart and grab your credit card and then sell it. A high frequency trader wants to jump in front of your trade and then sell that stock to you. A hacker will tell you that they are serving a purpose by identifying the weak links in your system. A trader will tell you they deserve the pennies they are making on the trade because they provide liquidity to the market. Over just the past 3 years, the market has changed. It is getting increasingly difficult to just invest in companies you believe in. Discussion in the market place is not about the performance of specific companies and their returns. Discussion is about macro issues that impact all stocks. And those macro issues impact automated trading decisions, which impact any and every stock that is part of any and every index or ETF. Combine that with the leverage of derivatives tracking companies, indexes and other packages or the leveraged ETFs, and individual stocks become pawns in a much bigger game than I feel increasingly less comfortable playing. It is a game fraught with ever increasing risk.